If someone is chronically or repeatedly sick, the sick person should get out and not return until the air is clean. We moved out and took nothing with us after we found our home was contaminated with toxic mold. It’s important to know what you are dealing with and then decide how to improve your indoor air quality when your mind is more clear — out of the mold. Unfortunately, it is not always obvious that someone is sick from poor indoor air quality. Many times the toxins are hidden behind walls and so small they are not visible. If you suspect your home or building is making you sick, here are some tests you can do yourself without hiring a professional or buying any expensive air testing equipment. The HERTSMI-2 tests for the 5 molds that are the most toxic indoor molds. These are the molds that produce mycotoxins and cause a large number of health problems. I recommend Mycometrics because they give the most reliable results. Some other bargain labs are not finding mold where people are sick and Mycometrics finds mold in a sample from the same home. All ERMI testing/HERTSMI testing is not equal. Download the ERMI chain of custody form. Fill it out and make sure you check the HERTSMI-2 box. 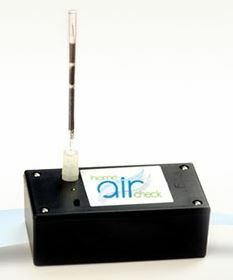 Usually, the HERTSMI is enough to get an idea of the indoor air quality over a period of time. The ERMI which tests for 36 molds– both indoor and outdoor molds can be added on later if you feel it is necessary after getting your HERTSMI results. $155 to the address on the chain of custody form. Plug the numbers from the HERTSMI-2 into the scale at that web page. This link explains more about VOCs and formaldehyde. If this tests checks for mold, why do the HERTSMI-2? The HERTSMI-2 gives more details about the type of mold in your house. Knowing mold is present is not enough. You need to know if that mold can make you sick. Not all molds make people sick… but some make people extremely sick and can even cause death. VOC’s and formaldehyde have made plenty of people sick… so don’t miss this piece of the puzzle. If people are chronically sick, or sick more than a rare occurrence… don’t stop until you find the cause! After we did the Mycometrics test, we had no idea where to find the mold. We knew we had a problem… but we did not know where or what to do next. We called in a professional to help us. We paid $1750 for environmental testing on my home that included air testing, tape tests, pictures, humidity testing and checking the walls for moisture with a special scope. This kind of thorough investigation was helpful for pinpointing where the mold problem was. If you are going to hire a mold professional, make sure the person you hire to do the testing is not also trying to sell you mold remediation… because that is a conflict of interest. Ask for referrals from other mold survivors. There are plenty of us out there that can point you toward the reputable professionals and away from the not so professional mold remediation companies.